Arkadij Naiditsch (born 25 October 1985 in Riga) is a German and Azerbaijani chess player who was awarded the title of grandmaster in April 2001. He was the clear winner of the Dortmund Sparkassen 2005 Tournament, ahead of higher-rated and well-known players such as Loek van Wely, Veselin Topalov, Peter Svidler, Vladimir Kramnik, Michael Adams, and Peter Leko. 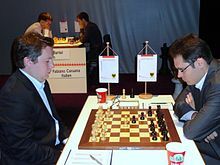 In 2007, he won the German national championship based in Bad Königshofen. In 2011 he won the 15th International Neckar Open with a score of 8½/9. This achievement enabled him to cross the 2700 Elo rating mark. In August 2014 he won with the black pieces against World Champion Magnus Carlsen, playing first board for the German team in the 41st Chess Olympiad in Tromsø. In December of the same year, he finished first in the 38th Zurich Christmas Open. In January 2015 he tied for 1st-5th with Alexander Donchenko, Eduardo Iturrizaga, Matthias Dann and Miloš Pavlović in the Masters section of the Basel Chess Festival, winning the tournament on best tiebreak score. Naiditsch tied for first with Magnus Carlsen in the 3rd Grenke Chess Classic tournament held in Baden-Baden in February 2015, finishing second after a five-game blitz playoff, which ended with an armageddon game. In July 2015 he switched to the Azerbaijani Chess Federation. On December 30, 2015 Naiditsch won for the second consecutive year the Zurich Christmas Open. Six days later, he won also the the Basel Chess Festival for the the second year in a row.